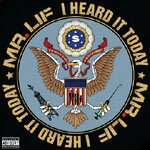 Brand new album and third official full length from Mr. Lif! Now practically a Boston hip hop legend, I Heard It Today comes three years after his last album Mo Mega was released on Def Jux back in 2006. Mr. Lif is no stranger to political rap, and the better half of this decade much of his material has been aimed at the previous administration in the White House. And while the rest of the world has embraced our current President with new hope, Lif, like many of us, also feeling inspired, has decided to seize this opportunity in history with what he does best, musically, to remind everybody, fans and listeners worldwide, that there is plenty of clean up to do, with many unsolved crises and unanswered questions. It doesn't stop with just one man in one position of power. Featuring guest appearances by Bahamadia and Vinnie Paz of Jedi Mind Tricks, with production by Batsauce, J-Zone, Cut Chemist and Edan, Headnodic, Willie Evans Jr. and Mr. Lif himself!